Nano-architecting is one design strategy to create lightweight materials that can withstand the harsh conditions in radiation-intensive applications, such as space. By nano-architecting, a key dimension of a structure is kept at the nanoscale without limiting the overall size of the structure, for example a large lattice composed of beams with beam wall thicknesses on the nano-scale. 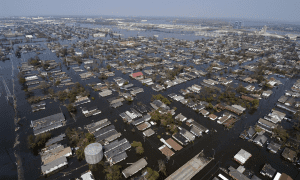 The nano aspect is key for exploiting certain beneficial material and mechanical properties that only come about when dimensions are reduced to the nano-scale. Metallic glass is a candidate material for such nano-architecting as it is strong, highly elastic, and can exhibit deformability when the characteristic dimension of the metallic glass is kept to the nano-scale. Metallic glasses have also been shown to exhibit improved deformability when subjected to irradiation. In an effort to exploit both these effects, Julia Greer and co-workers from Caltech fabricated metallic glass nano-lattices and irradiated them. These 3D metallic glass nano-lattices are composed of hollow beams of sputtered metallic glass with beam wall thicknesses ≈10–100 nm and are 20 times lighter than their bulk-level counterparts. Compression experiments conducted inside a scanning electron microscope revealed a substantial improvement in their mechanical response upon irradiation. Metallic glass nanolattices exposed to 12 MeV Ni ion irradiation actually became stronger and more deformable, with an average increase in yield strength of 35.7%. 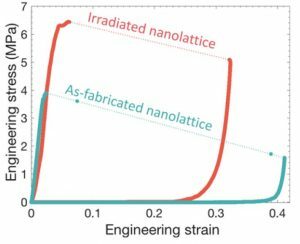 Enhanced deformability upon irradiation was apparent from the nanolattices’ accommodation of larger strains before any kind of failure, as well as the presence of smaller strain bursts and stress drops throughout the compression experiments. Irradiated nanolattices exhibited gradual, deformable layer-by-layer collapse while unirradiated nanolattices exhibited catastrophic failure with complete destruction of the failed layers. These findings point to nano-architected metallic glass as a promising candidate for ultra-lightweight, radiation tolerant materials.